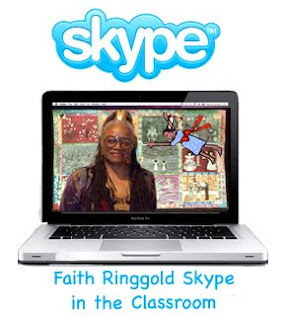 Faith Ringgold is offering a new program, Faith Ringgold Skype in the Classroom. The fee for the program is $500. Thanks to the technology of Skype Faith Ringgold can make virtual visits to classrooms across the country. The program is designed to use in a classroom with 40 or fewer students but can be customised for your school. The program contains an inspiring collection of digital materials by and about Ms. Ringgold for use in your classroom. The Skype in the Classroom Program includes the following digital files; Three power-point presentations: Tar Beach, How the People Became Color Blind, Ms. Ringgold’s, " From Story Quilts to Children’s Books 1980-2010 slide show". A Skype session with Ms. Ringgold lasts around 20-30 minutes. During the Skype session children may ask questions and share their projects, stories and pictures. Note: please email the children's questions in advance and send photos of the featured artworks so that Ms. Ringgold can see the projects clearly and be prepared to speak to those children. Please do a practice session with the children to work out the logistics. Ask the students to speak up and into the mike. A set up/ test call will be scheduled an hour or two before your actual session. Schools will be required to have the computers, connections and applications necessary to participate in this program. All of the program materials are in digital files and will become available to download from YouSendIt.com after a contract has been signed and the fee paid. Please create a free account at www.YouSendIt.com and download the YouSendIt Express application. The Express application will make downloading the program folder of materials a breeze. Distribution and printing of materials are limited to the contracted classroom only. If you prefer will will mail you a DVD. All materials by Ms Ringgold are protected under copyright law. To learn more about Skype and to download the free Skype Application go to http://about.skype.com. Please send payment and contract at least 30 days before your Skype session. This will allow the teacher time to preview the materials and create a schedule and plan for implementing the program. The $500 fee is non refundable. We understand that scheduled dates may need to be changed because of illness and technical problems to name a few popsicle obstacles. We will be flexible in re-scheduling Skype sessions with schools. After your program participation we hope that you will share artwork, comments and lesson plans on the section of Faith Ringgold’s blog that is dedicated to teachers and students. We look forward to seeing you on Skype! To book a Faith Ringgold Skype in the Classroom session please email the following information to Grace Matthews at Ringgoldfaith@aol.com. Grace will e-mail a contract and invoice back to you. Call (858) 576-0397 with questions, office hours are 9am to 4pm Pacific Time M-TH. Copy and e-mail to Ringgoldfaith@aol.com. Please let Faith know…Thank you! Especially so much for giving us so much time! The children loved it! It was amazing! We will share with you the finished quilt and please check our school blog to see our progress on the quilt. We hope it will be finished sometime in january. I will also spread the word of this wonderful program to my colleagues. What a fantastic experience! A great way to use technology in the classroom in a very meaningful way. Everything went really well. The students very much enjoyed the session (and were very well-behaved, which made me happy J). A big thanks to you and Faith for making this possible! l am ecstatic to read your blog. You are a new a role model for me. l am taking African American art history this semester and found you while flipping through my text book. I decided to write my research paper on you because l am also interested in Social issues and activism, especially through art. I am regretful to have missed my chance of seeing and hearing you recently in NC. i liked the book that i read that you made. tar beach it was very nice. i live in maine. and i like to write to.